July 6, 2016 -- Links International Journal of Socialist Renewal -- Jose Da Costa looks at the history of colonisation in East Timor and the situation today following 16 years of formal independence. Da Costa was 18 years old when he came to Australia by boat in 1995 seeking political asylum from East Timor. He is a teacher, actor and co-founder of Dili Film Works. Oil rig in the Timor Sea. Timor Leste's oil wealth has not benefitted the people. September 30, 2009 -- Dili -- What is commemorated as Timor Leste’s (East Timor) “liberation” is the United Nations-facilitated referendum on August 30, 1999. East Timor, which had been a Portugese colony, was already an independent country, as a result of the pro-independence political party Fretilin declaring East Timor independent on November 28, 1975. But barely days after the independence proclamation, on December 7, 1975, the Suharto dictatorship in Indonesia used all its military firepower to invade Timor Leste. The invasion was brutal and the occupation lasted 24 years before the UN referendum in 1999. During the occupation, the Indonesian military tortured and slaughtered our people. Such terrible acts became an everyday spectacle in Timor Leste. July 14, 2009 -- In 2008, the 700 Timor Leste and Kiribati students studying medicine in Cuba were joined by students from all over the South West Pacific -- Vanuatu, Solomon Islands, Nauru and Tuvalu. Their college in western Cuba has been called The Pacific School of Medicine. For more information see ``Solidarity aid: the Cuba-Timor Leste health programme'', visit the ``Timorese students in Cuba'' Facebook group at http://www.facebook.com/reqs.php#/group.php?gid=84093583428 or see the leaflet below. Mericio Juvinal dos Reis at the World at a Crossroads conference. Photo by Alex Bainbridge. 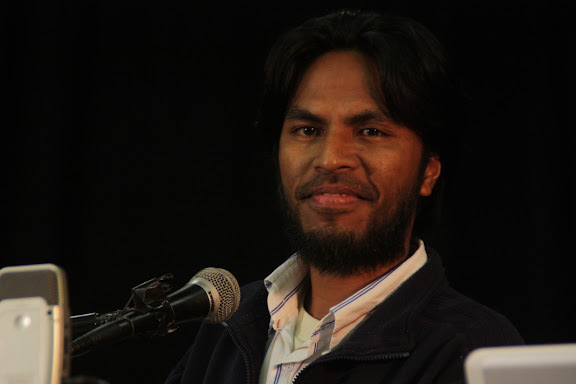 June 19, 2009 -- Mericio Juvinal dos Reis, or Akara as he is commonly known, is the executive director of Luta Hamutuk, a non-government organisation based in Dili, East Timor. Akara was a featured guest at the World at a Crossroads conference, hosted by Green Left Weekly, held in Sydney in April 2009. Vannessa Hearman spoke with Akara about East TImor’s ongoing struggle for genuine self-determination and development. East Timor won its independence formally in 2002, after a long and bloody struggle against Indonesian occupation from 1975 to 1999. In 1999, a United Nations-sponsored referendum was held, in which the Timorese people voted to be independent from Indonesia. Luta Hamutuk was set up in 2005 by a group of young activists, including Akara. Akara had been involved in pro-independence activities as a student in Indonesia. He was a member of the Timorese Socialist Party but left in 2003. Dili, July 8, 2008 -- On Monday July 7 at 9am, approximately 100 students held a protest on their campus, the East Timor National University, against the members of the national parliament. The students are not happy about the MPs who are about to buy a imported luxury car each for themselves. The students protested peacefully by holding banners, yet 21 students were detained by the Timorese National Police. Timorese law states that there may be no demonstrations within 100 metres of government buildings. However the students were protesting on their own campus. The location of the campus is indeed less than 100 metres from the National Parliament; however this is the students' campus, an important place for expression of free speech and demonstrations. It is not clear who issued the order to arrest the students but it is widely believed that the order came from Prime Minister Xanana Gusmao himself. May 13, 2008 (Latin Radical) -- Estanislau Da Silva was a prime minister of Timor Leste (East Timor) when Fretilin was the party in government. Before that, he was the minister for agriculture. He was in Australia this week to attend the launching of a book by a Timorese man, Naldo Rei, who grew up in Indonesian-occupied Timor Leste, as a committed supporter of the Fretilin-led resistance movement.